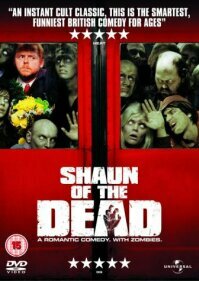 2000AD featured a comic prequel of this 'Romzomcom' (romantic zombie comedy) in prog 1384 (April, 2004) written by Simon Pegg & Edgar Wright, with art by Frazer Irving. 2000AD featured the comic adaption of this film in progs 1063-1070 (Oct. to Nov. 1997). Adapted by Bish-OP, with art by Steve Yeowell & Alan Craddock. The story combines elements from The Return of Rico (prog 30), The Day the Law Died (progs 86-108), The Judge Child (progs 156-181) and Block Mania (progs 236-244). Visually the film is excellent, but it was a dissapointment to the fans, especially after Dredd is taken off the streets. You can read The Return of Rico online here. Although not originally intended to be a 2000AD film, a court ruled that the story was significantly based on Shok (Judge Dredd Annual 1981, reprinted in prog 612). Steve McManus and Kevin O'Neill were added to Hardware's writing credits. You can read Shok! online here.